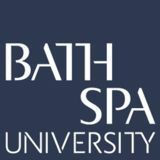 Come and enjoy a night of Jazz from the tutors at Bath Spa University Jazz BA. A relaxed night of great jazz in the cavern at Burdall’s. A real-life story from the memories of thirty people who lived through the Baedeker blitz in Bath. A war story like no other, Bath spent years watching the bombs travel over to Bristol; they thought they were safe. They said the Germans would never come to Bath. Until one night they finally came, bringing a night of destruction and devastation that Bath was unprepared for. Volpone is a brash, irreverent and bombastic tragicomedy, which centres on the themes of greed and deception. Jonson’s work boasts an eclectic and eccentric host of characters, and writing that packs a punch. Fresh Life Theatre is reimagining how people view classical text in this little known gem of a play. Witness a word for word retelling of what it took to survive the forgotten blitz. £6/£4/£3 CONTAINS SCENES OF A VIOLENT SEXUAL NATURE. Visiting hours are open at snowflake jail, come in and see why the inmates are driven to kill and the reason their lives had taken them to this point. Listen to the harm the people upstairs are causing because of their socalled higher power… and before you ask, you know who they are. Ladies and gentlemen, boys and girls of all ages, we graciously invite you to come and see the all-new and unique travelling circus performer, Curly the Clown! After travelling far and wide he has come to Bath to show and tell his many wonderful stories and put on the most perfect show imaginable. He’ll make you laugh, he aims to please, he won’t let you down, and he will make this show perfect! Alice is celebrating at Leamington’s latest night out when she meets Dan. A fellow Warwick Uni student, they hit it off and a few vod-bombs later end up going home together. What happens next? What would you say makes up your identity? We all wear so many faces, could you truly explain even one of them? Can you? Because I can’t. I can’t tell you these things because I don’t know them. I don’t have all the answers you are looking for. But maybe I can try to show you. This 3-act comedy is an exciting piece of new writing reflecting on student life, love and heartache. ‘Legendary singer-songwriter Charlie Starr died in a tragic car accident on the Spanish coast in the early hours of yesterday morning. With timeless hits like ‘Crash’ Charlie will doubtlessly be remembered as one of the most influential artists of our times. Fans from around the world are paying their respects, as are many of her contempories in the arts. Whilst no official announcements have been made as of yet Charlie’s longterm band are rumoured to already be planning a concert in the songstress’s memory. Goodbye Charlie Starr is a new kind of musical. Half gig, half play, Charlie’s songs will provide the perfect soundtrack to the story behind the making of her legendary first album. I’ll Take It From Here Over my shoulder I have a crippling wreck who is too anxious to ask about the price of batteries and over the other shoulder, there’s a touchy, sensitive recluse who is trying so hard not to offend. Over my third shoulder lives a cynic who judges harder than Judy. AND over my fourth, and final, shoulder, lies the most egotistical, self-assured creature outside of Trump Tower. A series of interventionist performances give a fresh interpretation to the Museum exhibits. Throughout the afternoon dancers and composers from Bath Spa University will present a series of short original performance works in response to the displays and spaces of the Museum. Be prepared to be surprised and delighted as dances appear as if from nowhere, and then vanish as if they had never happened. Join our Bath Spa University Students as they inhabit the four corners of the city during Party in the City. Musicians will be playing and singing in venues across the city and BA Dance will be performing highlights from The Moving Exhibition. Take a wander round and see what you can find! The human mind is a deep complex labyrinth, many have tried to explore it, many have tried to explain it, but few have ever broken it. Seven nights. Three strangers. And only one winner. Who can survive in the gruelling conditions of post government France? How will they get on? Find out as we take four plucky Brits and dump them in a foreign speaking country, to find out if they can survive these mildly inconvenient conditions on Brits in Paris! White flowers grew wherever she trod, and so was she called Olwen. How far would you go to marry a giant’s daughter? That’s the question Culhwch’s been asking himself this entire quest. It’s also the same question Arthur’s been asking him. And Gawain, and Sir Cai, and Bedwyr, and- you get the picture. There’s just the small matter of capturing an Irish king turned magical wild pig to go home victorious. No big deal. 100 years ago the world was at war, young men from all parts of Britain thrust into the front line of combat. How different their world must have been to today and the challenges faced by our generation. We bring to life the striking differences in society, our values and expectations since 1919. The hard-edged outlook of men in the trenches forged through traditionalist and class driven values versus today’s more enlightened world. This production questions the cost of “progress” and what we have lost along the way and aspects of human nature that remain unchanged. Jess and Harry are deeply, deeply in love. But what if they aren’t right for each other? Dancers as camera operators, cameras as performers, editors as choreographers, audience as... that’s up to you! Not just film of dancers dancing, screendance offers much more and provides alternative spaces for dance, and different ways of watching it. 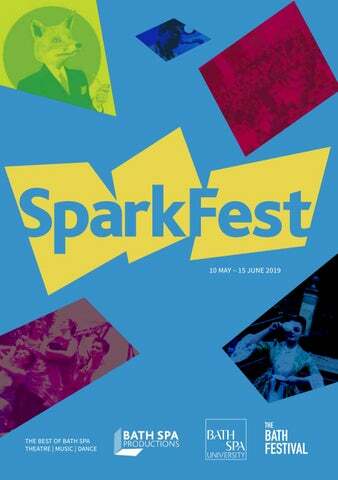 ScreenDanceSpark is a collection of short films made by Bath Spa students. Prepare to be surprised and delighted by a feast of movement and sound. What if your true love wasn’t a Prince Charming? What if your dream girl was more of a nightmare? What if there’s no difference between love being blind and love being toxic? What if you are just too close to notice the difference between love and control? Where originality is scarce and following trends is a matter of life and death, Tough Yolk take you on an absurd journey through a world of corruption, consumption and fruit. Lots and lots of fruit. The funeral is for one of them. Through an arresting collision of live music, storytelling and flamenco striptease, And Then They Died takes its audiences along for a fast-paced, anarchic account of five friends trying to tell their last story the right way, whoever’s story it may be. An evening of three short, interlinking plays. This two day festival event features the very best of Bath Spa’s Commercial Music students. Covering genres from Folk to Punk, and Electro to Soul, don’t miss the incredible talent on show. theatreLab presents an explosion of brand new theatre performance. We have given theatre makers space to explore their creative ideas and a platform for their voice to be heard. This evening of original work in all stages of development promises to be an exciting and dynamic event as we watch the creatives of the future break new ground. The world is being ravaged in the midst of world war, and the blitz is tearing apart Northern England. A young man. An old man. A past that’s living in the present. Can a road trip to the coast let them look to the future? Take a walk in Noah’s shoes and discover if time really can be a healer. Meeting all kinds of friends along the way, we embark on a journey through the countryside as one determined twelveyear-old desperately seeks some sense of solace, in the wake of a devastating bombing that leaves an entire family presumed dead. A heart warming tale of discovery, this is a true underdog story. One day is all it takes to change someone’s life entirely. You could win the lottery, meet the love of your life, get that job you always wanted. Sophie’s life changed the day she was assaulted on her walk home. Making matters worse her best friend Jack ignored her call that day, leaving her all alone. Fuelled by guilt and rage with no evidence, and no faith in the justice system, Jack takes it upon himself to make sure those responsible pay. When two best friends both want to ask the same girl to the prom they settle things like any reasonable human beings would do... By competing in a series of bizarre and random competitions that get wildly out of hand. Friendships will be tested, tears will be shed, and sweat will be... Uh, sweat. Breaking the confines of the traditional band show, this performance aims to blur the lines between exhibition and concert. Bus Nos. 3, 271, 272 & X31 stop at Snow Hill (3 minutes’ walk from Burdall’s Yard) See firstgroup.com for more information. Car The nearest free parking is available in the streets off Snow Hill. Free parking is also available after 8pm in the Cattle Market car park on Walcot Street (6 minutes’ walk from Burdall’s Yard). Passengers can also be dropped off in the loading bays opposite Burdall’s Yard. Train Burdall’s Yard is about 20 minutes’ walk from Bath Spa Train Station. Bus Nos. 231 and 271 run from the bus station next to the train station.